Council Oak Steaks & Seafood at Seminole Hard Rock Hotel and Casino is not only innovative, but a highly sophisticated, fine-dining experience that caters to those with the most cultivated tastes. The history and story behind the name goes back to the iconic, ancestral oak tree, which is still in existence on Hollywood, FL Seminole Tribe of Florida reservation, where tribe leaders gather to discuss tribal affairs. Rooted in history, Council Oak serves up the finest 100% USDA steaks from its very own butcher shop (located at the restaurant’s front entrance) featuring dry aged cuts 21-28 (cut right on-site) and NY strip steaks as well as 60-90 dry aged sirloins on select nights. The seafood is fresh from local waters and the Maine lobster is from Council Oak’s custom-made saltwater tanks. Go ahead and roll the dice, anything you pick from the menu will, without a doubt, be absolutely delicious! Let’s start with the appetizers. The Oysters Rockefeller, would be my top appetizer pick! 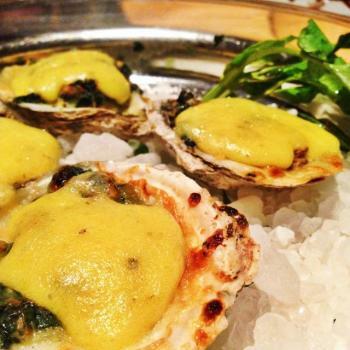 Fresh oysters stuffed with spinach topped with a rich and creamy Hollandaise sauce. Coming in to a close second was the seared ahi tuna served over a delicious Asian slaw and wasabi sauce, so fresh and oh so good. Next up, jackpot! Let’s talk about the beef – the main attraction. As I mentioned before all of the steaks are 100% USDA prime steaks and dry-aged for 21 to 28 days and everything is cut to order in their very own on-site butcher shop. There are plenty of steak options to choose from. 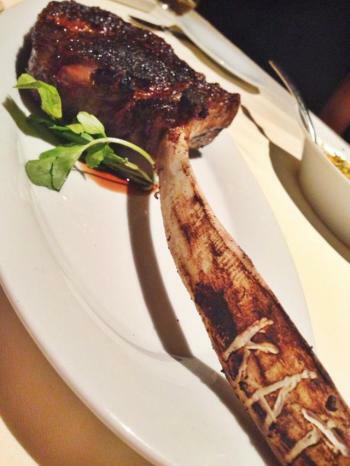 Guests can choose from the New York Strip, Porterhouse, Filet Mignon and my personal favorite: the Long Bone Cowboy Ribeye, a whopping 26 ounces of flavorful Ribeye and customized with your name on the bone (Holy Cow is RIGHT). There are plenty of non-beef options as well. The Double Cut Pork Chop Milanese, the Parpardelle Bolognese, the Free Range Half Chicken or the Dry Aged Lamb Chops featuring two double-cut lamb chops seasoned with fresh rosemary and roasted garlic. Or try the Surf and Turf, a popular choice by the high-rollers, a Petite Filet Mignon served alongside a South African Cold Water Lobster Tail. Don’t forget the sides… the sides are suitable servings to be shared by the entire table. A few favorites were the Lobster Mac & Cheese, the Sautéed Mushroom Caps, Council Oak Corn (ohhh my goodness SO delicious) and the newest and a must-try on the menu, the Truffle Risotto and Lobster Jambalaya. Okay, now let’s talk about the sweet stuff (my favorite topic). I recommend saving as much room as you can for dessert, which is a challenging request, but worth the reward. With options like the New York Style Cheesecake, a deep dish (and legit) cheesecake with a marvelous macadamia nut coconut crust or choose the Warm Salted Caramel Lava Cake or Crème Brulee. It’s going to be a tough choice to choose just one. If I had once choice… I would go with the famous Council Oak 151 Volcano. Hot, hot, hot! Are you ready for this? 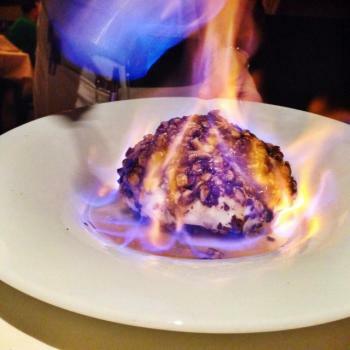 I don’t think you are… Vanilla bean ice cream smothered with Health Bar Crunch flambéed table side with a shot of Bacardi 151 Rum. The dessert is large enough to share, but I don’t recommend you will want to – just trust me on this one. Speaking of lighting things on fire, Council Oak has a birthday coming up and it’s time to dig out the candles! On September 28th Council Oak will celebrate their 7th anniversary. Lucky number seven! With seven amazing years, comes great changes. Changes, like welcoming the newest member of the Council Oak and Seminole Hard Rock Hotel & Casino family, Chef Michael Balles. Michael grew up in Atlantic City, New Jersey with a degree from the Academy of Culinary Arts. 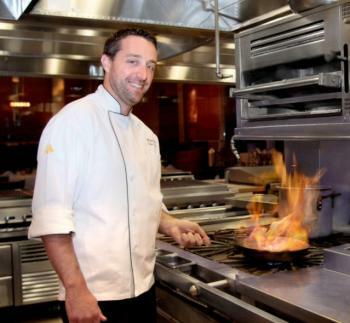 His past experience includes the opening of Bobby Flay Steak (Hey Bobby, we look forward to your visit) at the Borgata Hotel & Casino in Atlantic City, NJ as well as working at Wolfgang Puck American Grill and American Cut by Iron Chef Marc Forgione. He oversees 20 cooks and one chef in Council Oak Steaks & Seafood and Plum VIP lounge. Joining him is Doug Scagliola, the new resident Sommelier and Assistant GM and Candace Quiñones, the new Council Oak General Manager.